If you believe the hype, you know that our children’s noses scarcely move further than an inch from their iPhones and that they care more about the latest Taylor Swift album than they do about politics or healthy eating. But what if you make politics and healthy eating relevant and fun? Enter the Great Big Crunch. 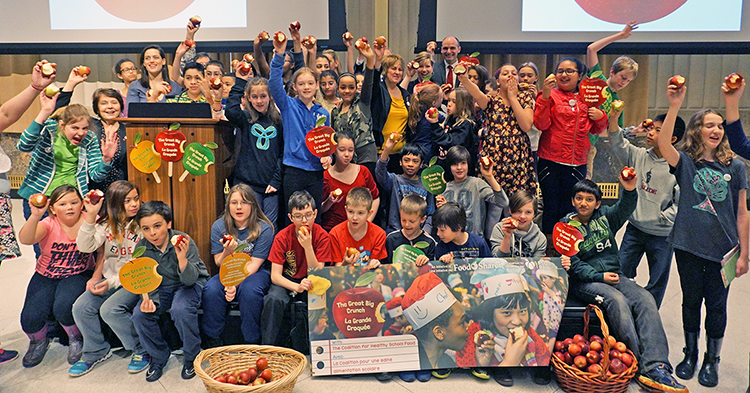 Launched nine years ago by FoodShare Toronto, the Great Big Crunch is a yearly moment of anti-silence in which children from across the country bite into apples in unison to celebrate Nutrition Month and call attention to the need for healthier food for kids. 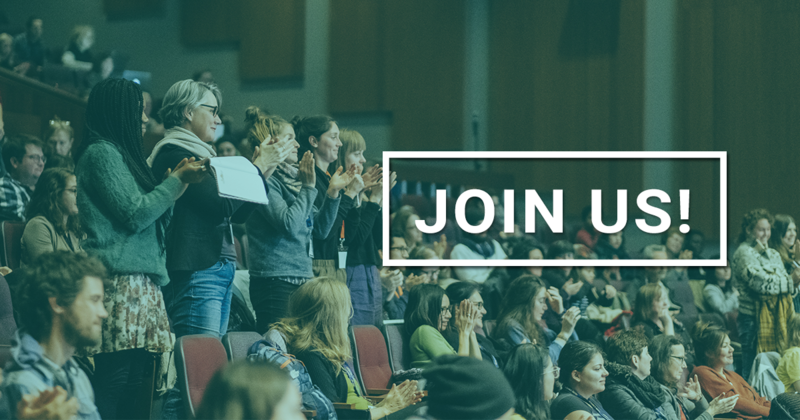 This year, those children numbered 200,000, four percent of Canada’s five million students. 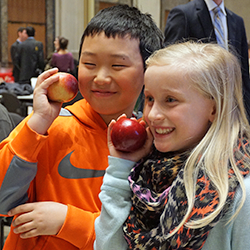 The 80 children who joined Food Secure Canada and the Coalition for Healthy School Food on Parliament Hill did not once talk about Taylor Swift. But they did talk about healthy eating and food systems. They learned about seeds, biodiversity, and composting. And they were overjoyed at the opportunity to pose with MPs and Ministers to support healthier school food. Maybe it’s the cool new government and its charming Prime Minister, but these kids were engaged. So too were the 15 Parliamentarians who joined us, among them Jean-Claude Poissant, Parliamentary Secretary of Agriculture; Jean-Yves Duclos, Minister of Families, Children and Social Development; Kent Hehr, Minister for Veterans Affairs; Ruth Ellen Brosseau, the NDP’s Agriculture Critic; and Karen Vecchio, the Conservative Families, Children and Social Development Critic. These MPs spoke to their concerns about food insecurity and to their support of healthier school food. And when, after the event, we delivered apples and information on school food programs to Parliamentarians entering Question Period, many of the MPs and Ministers with whom we spoke seemed to share these concerns. Several told us that they had already had their apples that day, and indeed, several had Tweeted pictures of themselves Crunching. Canada remains one of the world’s only industrialized countries without a school food program. Considering the deleterious health challenges facing Canada’s children, this situation ought to change. After all, only one-third of children between the ages of four and 13 eat five or more servings of fruits and vegetables per day. One-third of primary students and two-thirds of secondary students go to school without eating a healthy breakfast, impeding their educational success and their behaviour. Children spend much of their waking lives at school, and their health behaviours are thus shaped by their school food environments. Indeed, a recent Senate report on the state of obesity in Canada underlines the importance of health promotion in schools and recommends the federal Minister of Health advocate for “school programs related to breakfast and lunch programs” to her provincial and territorial counterparts. Where school food programs exist, children have been found to consume more fruits and vegetables and to have increased health, behavioural and educational outcomes. For this reason, the Coalition for Healthy School Food is calling for a national healthy school food program. 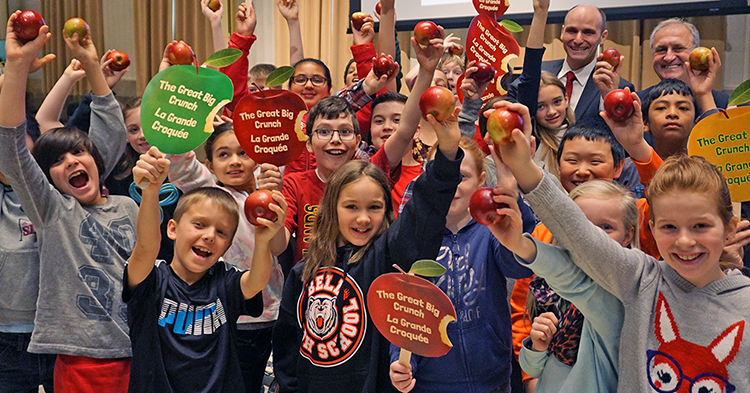 It seems Canadians would agree: the hashtag #GreatBigCrunch trended on Twitter that day, in the top three in Canada, alongside Prime Minister Trudeau’s visit to Washington. So too would Canada’s children, if those in attendance were anything to go by. In the words of 11-year-old Max Molnar, “We want to be healthy. We want to be active. We don’t want to be a couch potato.” Plenty of apples, but not an iPhone in sight.